If you are managing a car dealership, or running a business in the automotive sector, you probably already know that there’s a growing list of review sites where buyers and consumers are sharing their experiences and opinions. But there’s another super-important site that your marketing department or reputation manager should not ignore, and it’s a site that’s not necessarily known exclusively for automotive information or car buyer reviews. We’re talking about your reviews on search engine giant Google, such as those that appear on products and apps like Google My Business and Google Maps—these reviews can be written by consumers as well as Google’s “super users” aka the Google Local Guides. According to a study by Digital Air Strike, as much as 70 percent of car buyers say that online reviews and ratings influence their purchase decisions. This means that they’re performing search queries to find the information they’re looking for. Google – being today’s biggest search engine – obviously gets a lot of traffic from these review-seeking potential customers. So, it should go without saying that monitoring and managing your Google reviews will go a long way in helping you enhance your search performance, improve your online visibility, and generate targeted leads with purchasing power. By listing your automotive business or car dealership on Google, you get to plant multiple flags at once. What do we mean? Well, your business information on Google will appear on many of their products and apps, including Google Search, Google Maps and their local business discovery engine Google My Business. It will also appear on third-party location-based apps and services powered by Google (via API). Currently, there are more than a million sites using just the Google Maps API, making it the most heavily used web application development API. According to industry research, 43 percent of all search queries on Google carry local intent. This means that consumers and car buyers aren’t just searching for a service shop or a dealership. They’re searching for a nearby service shop or dealership. 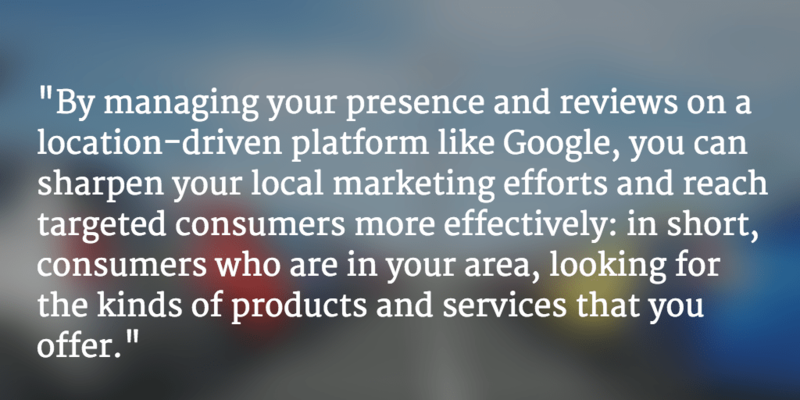 By managing your presence and reviews on a location-driven platform like Google, you can sharpen your local marketing efforts and reach targeted consumers more effectively: in short, consumers who are in your area, looking for the kinds of products and services that you offer. Unlike with Cars.com or Edmunds, there’s a unique social aspect to marketing your business on Google. It’s all because of Google My Business, the social network that doesn’t merely connect consumers with friends and family; it also serves as a service for exploring interests and discovering local businesses. Let’s say that a happy customer who’s on Google decided to write a positive five-star review of your automotive business or dealership. That powerful word-of-mouth recommendation will also appear on the Google My Business pages of people who have that review-writing customer in their “circles.” It’s a great way of extending your social reach and marketing to a broader audience. Don’t get it wrong: review sites are not meant to be a one-way street. When you claim and manage your Google My Business account, you’ll see that there are multiple opportunities for you to be able to engage with existing and potential customers. You can respond to reviews. You can add your contact information, your physical address and location, your company profile, and photos of your establishment. Using your account, you can even launch new promos and special offers. In short, you gain greater control over what’s being said about you online, and you can implement new ways for customers to find you, no matter what device they’re using. Looking to monitor and manage Google reviews, as well as reviews on other sites like Cars.com, Edmunds, and Yelp (among many others)? Sign up today for a free trial of Review Trackers, a reputation management software platform, and find out why our clients in the automotive industry love our product!